Microsoft announced today that its latest update to Windows Phone 8 has been released and contains a number of fixes. The update is called "GDR2," which is Microsoft's internal name and reportedly stands for "general distribution release 2," according to previous reporting by ZDNet's Mary Jo Foley. Microsoft said in May that GDR2 would arrive sometime in the summer. GDR1, reportedly code-named "Portico" and officially known by the OS build number of 8.0.10211.204, was rolled out between late last year and early this year. In a blog post Tuesday, Microsoft's Michael Stroh outlined what users can expect in the new GDR2 update -- which has the OS build number of either 8.0.10327.77 or 8.0.10328.78 -- and when. While the update has been available "for several weeks" now, according to Stroh, the timing of when users actually receive it on their Windows Phone 8 devices depends on their carrier and the model of their device. The Nokia Lumia 925 and Nokia Lumia 1020 already come with the update preinstalled, Stroh said. For the Nokia Lumia 928 on Verizon and the HTC Windows Phone 8X on AT&T, the update arrived last week. For the Nokia Lumia 822 on Verizon, users began receiving alerts that the update is available to them on Tuesday. For other Nokia Lumia models (920, 820, 720, 620, 520, 928, 822, 521 and 810), the update is bundled with Nokia's own software update called "Amber." Nokia began rolling out the Amber update last week, and expects it to reach all affected users by the end of September, according to this blog post. Stroh did not give timeframes for when other Windows Phone 8 devices may receive the update. Stroh gave a few details in his blog about some of the new features and changes being delivered in GDR2. Notably, Microsoft has added support for sync protocols CalDAV and CardDAV, ensuring that new Windows Phone 8 devices will be able to synchronize with Google's mail, calendar and contacts services. Google announced late last year that it was dropping support for Microsoft's Exchange ActiveSync protocol in favor of the CardDAV protocol for syncing with its Google Apps services, though Google recently extended its support for ActiveSync to last until the end of this year. Another improvement is to the way Windows Phone 8 manages the "Other" storage category. Stroh described this category as "a catch-all for temporary operating system files, e-mail attachments, app or game info, and other digital ephemera." Previously, there was no obvious way to reduce the size of the "Other" partition or to know what specifically was stored there, which, as Stroh noted, became an issue for many users when their available internal storage ran low (see "Wrestling with 'Other' Storage in Windows Phone 8"). With GDR2, Windows Phone automatically deletes all but essential files from the "Other" category whenever the phone runs out of internal storage. "The operating system still needs this area as a temporary storage bin, so it's unlikely you'll ever see Other completely empty, but it should no longer block you from downloading apps or updates (unless you go crazy with tons of gigantic email attachments)," Stroh wrote. 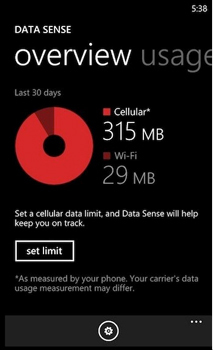 The update also brings the Data Sense feature to more carriers, though Stroh did not specify which. Previously, the feature was only available to users on the Verizon network. 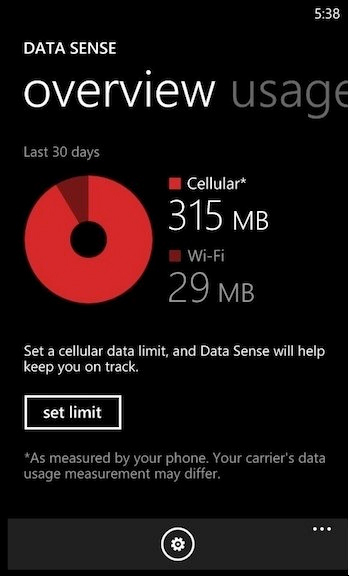 Data Sense helps users stay within the bounds of their data plans by setting data-consumption limits, compressing Web site data and tracking which apps are eating up the most data. GDR2 also includes fixes to Bluetooth issues, improved app stability, new messaging and voicemail capabilities, camera improvements, an updated Internet Explorer and -- for devices that support it -- the ability to play FM radio. Microsoft keeps track of Windows Phone 8 updates on this page.